Wow, it has been a long time! Wow, I can not remember the last time I have gone this long without checking in! Oh how I have missed being here! So why you ask have I been missing? Well the picture above is the culprit. My house. Yes, my house has been the reason I have had zero time to myself for the last two weeks; the two weeks before that? Well before that I had just procrastinated and was overdue for a visit! So how does a house cause me to be so busy I have not been here? Well we decided, rather suddenly, that we wanted to sell our house. We have talked about it for a few years but when we made the decision we moved rather fast. So we have spent the last couple of weeks getting it listed and ready for showings. Whew! As any of you that have sold your homes know this can be a process! And it was! But after much work and a little time we had our first showings this past Saturday and they went well. So now we are waiting for news and while waiting I thought what a better thing to do than drop in here and say “hello” and catch you up! And I will catch up with you! So I am going to browse around your blogs now and see what is happening. I hope you all have been well and being grateful everyday! I will admit I’ve been challenged lately to be grateful regardless of situations and so far so good! I know it may get harder as days go by; I am ready! With God’s help! If by chance you follow my YouTube channel I’ve been updating that almost daily! So you can catch up there with things! Until next time, I will talk to you soon! Hey you all! I know I promised an update each day…but I am grateful to say I have been pretty busy, so I have slacked! I am also grateful to say that I have kept up on my challenge and when I have a moment I will tell you how it is going! How is it going for you? Have you participated in my little challenge? I can’t imagine what would happen if everyone stopped for a minute and decided to make an effort to be kind to someone! Well off I go to my sales meeting and pitch in! 😉 Busy day ahead! Life is a Rollercoaster…..I don’t always like roller coasters! 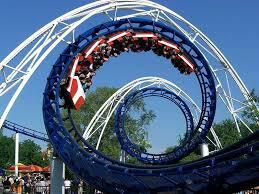 Life can be like a roller coaster….and I am not sure I really like roller coasters! Well, there are some that I like, just not all! And I guess that is about how life is too! Sometimes I have days when any situation, good or bad, can hit me and I am OK with it. I deal with them well, don’t seem to get too emotional one way or the other about it, it’s all good! Then there are days when I wake up and have this gut feeling that things are going to be a little harder to handle today. I’m sure you can relate. So today is one of those days. Over the last few days I have had major highs!! Getting back into a business I love and having it take off….love it! But then, as business can be (especially real estate) some of my business takes a nose dive and I have to deal with that. In the beginning of any business that is a hard pill to swallow! You want business and need it too! When clients don’t pan out, for whatever reason, it hurts, in more ways than one. This is what has happened to me over the last few days. This is also what caused my heaviness when I woke up this morning. I’m sure at this point, if you follow my blog, you are wondering how I handled this feeling and how my day is going so far?! Well, when I woke up this morning I did say “thank you” and “I love you” and ” I am so grateful for all I have” but this morning I added one ” I NEED YOU” yeah…… so it is important to admit when you need help. Whether it is with attitude or with …well, whatever! This morning I felt the need for some help with my attitude! I felt that heaviness and I did not like it!! Not at all! Kind of like I don’t like roller coasters…mostly! haha! So I asked for help! I asked for that heaviness of heart to be removed. I asked for a lighthearted and positive feeling to replace it. SO you may ask “is it really that easy?” Guess what...that is NOT that easy a thing to do! Think about it…. when you are being overtaken by gloom and doom, is it easy to seek the positive feeling? No…it is human nature to stay where you are! It is not an easy thing to ask for positive feelings to replace the pessimism in you; while you are in the midst of it. But I found out a long time ago if I will just try it and if I will be consistent in my trying, that it does get easier with time and it gets more effective too! BUT….I don’t think it is ever 100% easy! This morning I woke up with a feeling of dread and sadness. Still I expressed how grateful I am for what I have and I was filled with Love for all…..then I asked for help from my creator to replace my feelings of dread with love, optimism, hope…..we always have hope. How do I feel now? Pretty good! And right away I could feel the difference in my level of hope towards my business. When I am down in the dumps it is simply impossible to see the light at the end of the tunnel. When I offer gratitude and love the light seems to find me.